When is too young to start exercising? Childhood obesity is growing leaps and bounds, as soon as your kids are up walking around is when you should get them active. According to the Centers for Disease Control and Prevention, more than one third of children and adolescents are obese in the United States. Teaching your children proper nutrition and regular exercise should begin at a very early age. Habits are hard to break; teaching them early- on is a huge advantage in today’s society. We live in a world of computers and video games. Back when I was growing up, you get home from school and you go outside to play. Nowadays, most kids sit on the couch and play video games. What parents do not understand, by allowing this, they are setting their children up for potential risk of developing diseases such as Diabetes, Auto- Immune Problems, Heart Disease and many more weight related problems. Being overweight as a child not only brings on health problems, but also emotional problems. Just like putting bad gas in your car and having a negative effect, the same thing happens when ingesting bad foods. With all the junk food and processed foods that surround our children in today’s world, it leaves them in a state of depression and they become lethargic. This creates a vicious cycle of emotional eating that carries on into adulthood. Having a bad relationship with food can potentially lead to eating disorders such as anorexia or bulimia. Getting your kids to exercise is easy, make it fun! You have to make it exciting so your child does not feel like it is work. Go to the park and play, register for a 5K in your community, sign up for a variety of different sports to see where your child shows the most interest. Get the whole family involved, making this your lifestyle, will be easier for your child to adapt. Encourage them to play outside with activities such as riding bikes, jump roping, or maybe even a game of kickball with the neighborhood kids. 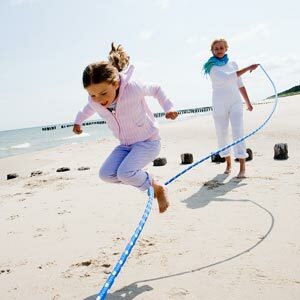 When exercising is fun, your kids will want to participate and like it! When it comes to nutrition, get your kids involved in the grocery shopping. Teach them as you are walking the aisles and help them with choosing better choices when it comes to food. You can control what they eat before and after school, but how do you know what your child is eating during lunch? Packing lunches is a good way to know your child is getting the proper nutrition. Let your child prepare lunches with you and let them help. Having fun colorful containers and making different shapes with the food will help make this meal be more appealing. Just something as simple as a cookie cutter and using it to slice their sandwich will have your child excited to sit down at lunch. Always add in a fruit and keep plenty of individual packs of nuts around. You can throw in a 100% natural juice or organic milk is great way to know your child is getting in the nutrients and the vitamins to sustain energy throughout each day. By creating a healthy environment within your family, not only are you doing yourself a favor, but you are creating the ground work for your children to lead healthy and active lifestyles throughout adulthood. A healthy lifestyles starts with the parents and you are the role model, the choices you make will affect your children. Learn as much as you can about proper nutrition and exercise. Go and seek out a personal trainer to help you. A lot of personal trainers offer things such as grocery store tours, where you will learn many different options when eating healthy. Start today by setting small goals for your entire family to achieve, write down your plan of action and get moving! BodiesByCindy.com Cindy Ross has become a recognized leader in the Fitness Industry and with her collegiate and professional tennis career, living with Rheumatoid arthritis for 12 years, having over 22 surgeries, losing her mother to Scleroderma, a brother to Type I Diabetes, and through her own self-discovery, Cindy shows great fortitude and is motivating audiences nationwide! Cindy will leave you in Amazement as she unfolds her story of illness, accomplishments, knowledge of health, fitness, and nutrition!